You are here: Home » Blog » Health » Does the Bible Say We Should Eat Grains? Does the Bible Say We Should Eat Grains? It is certainly a valid point to consider and as a Christian, it was one I researched while going grain-free. Fortunately, for those of us striving to eat as healthy as possible and to live good Christian lives, the answers aren’t conflicting. 1. The Grains of Biblical Times are Much Different Than The Grains of Today! There certainly are many references to grains in the Bible, and with good reason. The Bible was compiled during a predominately agricultural time, and this would have been a reference that was easily understood by the people during that time period. Though the Bible references grains, the grains consumed a couple thousand years ago bear little to no resemblance to the grains we consume (or don’t consume!) today. In Jesus’ time, there were only three major types of wheat in existence: Einkorn, Emmer, and later Triticum aestivum along with simple, non-hybrid varieties of other grains like barley, millet, and rye. These grains had (and still have) a higher protein content and lower anti-nutrient content than grains of today. This is a stark contrast to the 25,000+ species that exist today, most of which we created in a lab to be disease resistant or produce high yields. In order to achieve these traits like disease and pest resistance, scientists had to enhance the part of the grains that naturally resists disease and predators: mainly, the glutens, lectins, and phytates- the most harmful parts of the grains to humans. In addition, these hybridized strains are often allergen producing and usually sprayed with pesticides and chemicals. It is interesting to note that some people who are allergic to modern strains of wheat show little to no reaction to (properly prepared) Einkorn wheat in small amounts. 2. The Grains of Biblical Times Were Prepared Differently Than The Grains of Today! Besides the differences in the basic genetic structure of the grains, grains in Biblical times were processed much differently, and consuming them in modern form wouldn’t have even been an option. Since grains do contain anti-nutrients like gluten, lectin and phytates, these components have to be neutralized somehow. 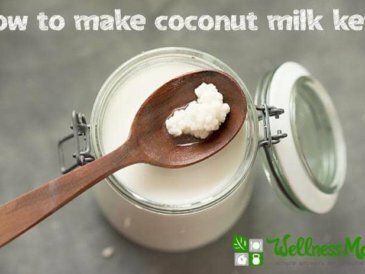 Traditional cultures throughout the world have found ways to lower the effect of these harmful properties. 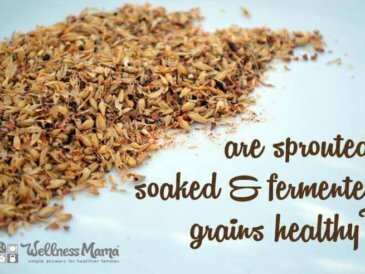 In Biblical times, grains were often prepared by soaking, fermenting, or sprouting before being consumed. Often, this wasn’t intentional, but a result of methods of storage which left the grains exposed to warm, moist conditions that encouraged sprouting and fermentation. When a grain sprouts, the chemical structure changes and the anti-nutrient content is greatly reduced. Fermentation mitigates this further. 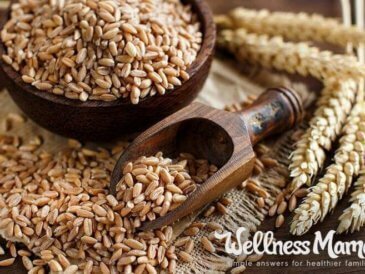 Grains are harmful to humans when consumed straight off the plant in an uncooked or un-prepared state. In addition, any grains consumed in Biblical times could truly have been called “whole grains” unlike the processed granola versions of modern times. Equipment didn’t even exist to grind grain to the micro-fine particles that we call flour today. Grains were often ground, by hand, using stones or similar objects. Think of the difference in particle size between a hand-ground, sprouted piece of wheat and the dried, hybridized, dust-like flour we use today. 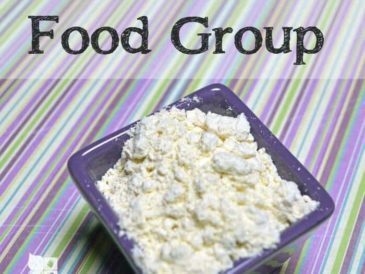 The flour we consume today is ground to such a small size that the surface area of the grain is literally increased 10,000% and the starchy area is expanded. As a result, the body quickly converts it to sugar, which is why flour and processed foods can have as much of an impact on the blood sugar as pure sugar can. Another obvious point to realize is that any reference to grain in Jesus’ time was a reference to an actual grain, in whole form or made into bread (that also wouldn’t resemble the stuff you get at the store!). Certainly, grains in Jesus’ time would not have been made into donuts, pretzels, chips, snack foods, cookies, etc. Grains in Biblical times also wouldn’t have been mixed with vegetable oils, high fructose corn syrup, chemical additives, commercial yeasts, artificial flavorings, or other ingredients used today. Jesus wouldn’t have been snacking on Chex Mix or chowing down on bagels or soda while he was fishing. If one truly desires to eat grains because they are referenced in the Bible, than these grains should be one of the three varieties that actually existed in the Bible, and should be prepared in a similar way and eaten in a similar way (though I’m not sure this is what many people are envisioning when referencing the Bible for their reason for consuming grains). If you read the text carefully, Adam and Eve are given the plants and fruits to eat in the Garden of Eden when there is peace and optimal health (considering death didn’t enter the picture until after the fall). In this sense, one can wonder if grain consumption was part of God’s plan in the beginning at all. Of course, God created grains, as he created everything, and saw that it all was good. An important distinction to make is that not everything that is “good” is necessarily “beneficial” to the human body. God created poison ivy, which has its place in the eco-system, but which is not beneficial to the human body. God created many poisonous species of plants and animals, and they are good, though not beneficial to the human person. God created grains, and while they have been consumed at times throughout history, nowhere is it specifically declared that they are beneficial and healthy for the human body, or that their consumption is part of the optimal diet for humans. The context of the Bible was an agricultural time period when grains were sometimes necessary for survival or population growth. Especially considering the differences in grains today, it must be evaluated if grains are still a necessary part of the human diet. 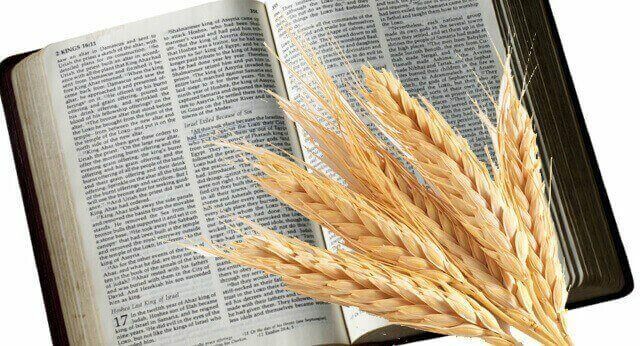 While grains are referenced often in the Bible, these references are not always positive. From the animal offering of Abel that was preferred to the grain offering of Cain, to the admonition to Adam to till the soil until death, the Bible has its share of negative grain references as well. The Book of Ezekiel is one of the most detailed and well-known references to grains, as God commands Ezekiel to use “wheat and barley, and beans and lentils, and millet and spelt” to make a bread for the people to eat. Taken in context, the book of Ezekiel is not a pleasant time. During Chapter 4, there is an impending siege, and these grains are all that is available. In fact, these foods are seen as food for animals, and Ezekiel protests having to eat them. Because of the pending siege and famine, Ezekiel is also told to eat carefully portioned amounts to make sure there is enough food. In verse 12, Ezekiel is commanded to cook this “bread” over human excrement, “For your food you must bake barley loaves over human excrement in their sight, said the Lord.” When Ezekiel protests, God allows him to use cow dung instead…. hardly appetizing, huh? Just as grains are often linked with hardship, many references to meat and fat in the Bible seem to promote their use (which is interesting, because many diets that encourage a Biblical way of eating often minimize meat consumption). When the prodigal son returns, the father kills the fatted calf in celebration instead of making a cake or baking some bread. In the Old Testament, meat sacrifices were often required. In fact, at Passover, the blood of a lamb (foreshadowing Christ) was necessary to save the firstborn sons. The passage makes it very clear that unless the Israelites actually consumed the flesh of the lamb, they would not be protected. It times of fasting or sacrifice, people in Biblical times (and still today) abstain from meat. From a scientific standpoint, there are health benefits to fasting, especially from occasionally removing proteins and fats for a short time. Abstaining from meat as a form of fasting (as Catholics still do during Lent and many other religions do at times as well) shows that meat is something to be enjoyed and consumed! Throughout the New Testament, references to bread take on a parallel to Christ himself. Jesus is born in Bethlehem, (translated “House of Bread”). Jesus is laid in a manger, a feeding trough for animals. So when Jesus refers to himself in this way, and when we pray for “Our Daily Bread” in the Our Father, are these references an encouragement to consume grains? I’d say that these references are not meant to be a nutritional directive, but rather to reveal important theological truths. As I mentioned above, there are many references of grain consumption during times of trial and famine. Bread was consumed during fasting and times of trouble or sacrifice. These references are sprinkled throughout the Old Testament and would have been understood by the Jews during Jesus’ time. Since Jesus became man to become a sacrifice for our sins, these parallels remind us of the sacrificial role Christ will take on. Jesus also refers to himself as the “Lamb of God” in the Gospel of John, and these two titles taken together have a lot of meaning. As was foreshadowed in Old Testament Passover, the lamb was slain so that the angel of death would pass over God’s people. Christ’s sacrifice, the last one needed, offers redemption as He dies for our sins. Jesus celebrates the Last Supper with his disciples at the time Passover would have traditionally have been celebrated by the Jewish people. The Last Supper takes place on the feast of unleavened bread, when the sacrificial lamb was typically consumed. Though, the lamb is noticeably absent from the Last Supper. At the Last Supper, Jesus holds up the bread, saying, “This is my Body, which is given up for you.” At this central moment, Jesus links the two titles he has called himself, the “Bread of Life” and the “Lamb of God.” The “bread” becomes the “Lamb”, which is to become the sacrifice for all mankind. The next day, Jesus is crucified and dies at the hour that the sacrificial lamb is usually killed during Passover. All these connections would have had deep meaning to the Jewish people who would have recognized their references in Scripture. Jesus, as God incarnate, was both the “Bread of Life” sustaining His people in times of trouble and trial, and the “Lamb of God” that takes away the sins of the world. The references connecting Jesus with “Bread” are very important to the message of His Sacrifice for us. They are not ever presented as a dietary guideline or a mandatory command to consume grains. Just as vegetarians can avoid meat without worrying about not following the references to meat-eating in the Bible, a Christian can certainly avoid grains without worrying about not following a Biblical directive. Jesus drank wine and his first miracle was turning water into wine, though I’ve never seen anyone argue that it is wrong to avoid drinking because Jesus drank wine. More importantly, as Christians, we believe that our bodies are temples of the Holy Spirit and should be nourished and treated as such. (“Do you not know that your body is a temple of the Holy Spirit, who is in you, whom you have received from God? You are not your own; you were bought at a price. Therefore honor God with your body,” (1 Cor. 6:19-20)). For this reason, it is worth considering for a Christian, if grains in their modern form should even be consumed for those trying to live as healthy as possible out of respect for a body made in the image and likeness of God. In my opinion, grains certainly can be avoided, and often should be! While there was perhaps a time in history when smaller amounts of grains, properly prepared, could be consumed without damaging the body, this is not the case today. As mentioned above, grains today are much different than those of Biblical times. 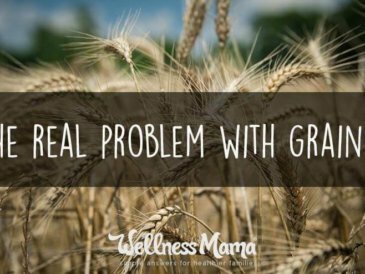 Many studies are now linking consumption of modern grains to inflammation, arterial plaque, joint problems, arthritis, infertility, PCOS, and many other conditions. 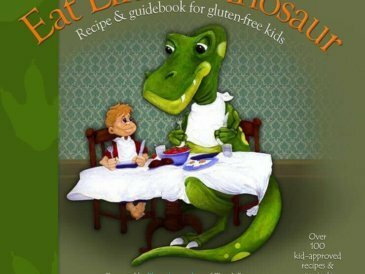 Celiac disease, gluten intolerance, Type II Diabetes, Heart Disease and Cancer are all on the rise. Even small children are showing signs of insulin resistance and obesity. As a whole, our society suffers from damaged metabolisms and impaired insulin function. For those who still want to consume grains in Biblical fashion, I suggest finding one of the three original strains, taking special care to prepare them by sprouting, fermentation, or both, and eating them in moderate amounts along with a lot of veggies and meat. For me, I don’t feel as well with any grain consumption, even correctly prepared, and the time needed for proper preparation just isn’t worth it. There are many other sources of nutrition that can be eaten in the whole form God gave us, without the need to process or even cook before eating. Calorie for calorie, meats, fats and vegetables are much better (and more bio-available!) sources of nutrients, without the harmful anti-nutrient content. For the small percentage of people who can tolerate grains without ill health effect, moderate grain consumption might be ok. The rest of us should consider the potential negative effects. Many people will continue to eat grains, even in light of the emerging evidence, and this is certainly their right and prerogative. Heck, if a person wants to eat only Cheetos and Pepsi for the rest of his life (however short it may be! ), that is his decision. My hope is just that Biblical references to grains won’t be used to justify eating processed flours and foods that are nothing like the actual grains of Biblical times. What’s your opinion? How do you think Biblical teaching fits in to grain-free eating (or doesn’t fit)? Weigh in below! What's the Deal with Spelt?